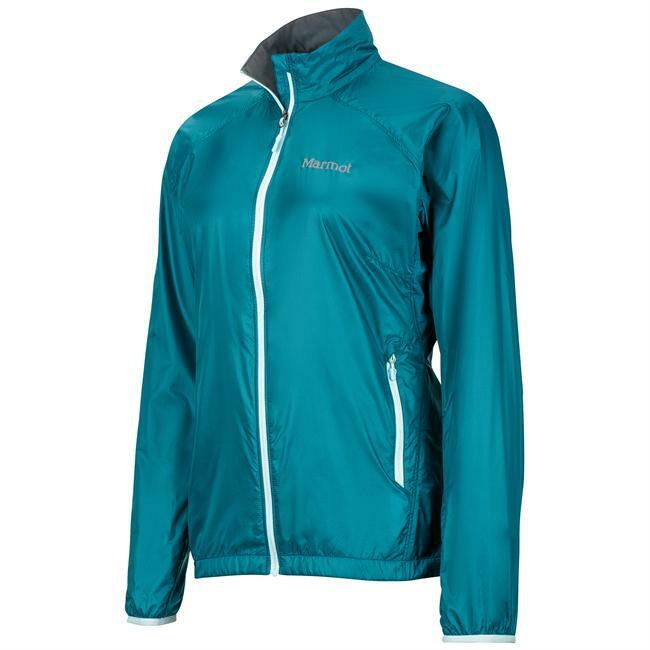 Description: This is an ultralight wind jacket combining merino mesh panels for breathability and comfort and a DWR nylon to provide wind and weather protection. 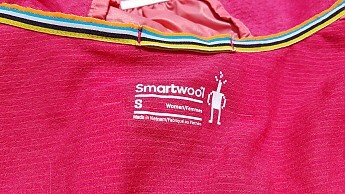 The merino mesh panels are strategically located (or "body-mapped" as Smartwool puts it) in areas where heat and moisture build-up occur, i.e. 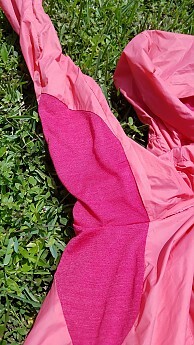 the armpits and upper back and can be identified in my pictures by the darker pink material. I am 5'9", 130 lbs and received a women’s size small. I used the jacket for part of my thru-hike of the Pacific Crest Trail, from July 6th to September 13th, 2018, in temperatures ranging from 30-80 degrees F. If allowed to keep the jacket, I plan to continue to use it on day hikes and bikes, short overnights, and perhaps another thru-hike during summer conditions. The fit of my jacket is very snug...it fits well when I am wearing only one baselayer underneath but with two or three layers, it understandably becomes a bit constrictive in the shoulders, arms, and chest. 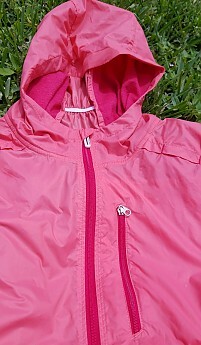 After all, it is intended to be an ultralight shell suitable for two to three-season use and not a jacket to go over many other layers. 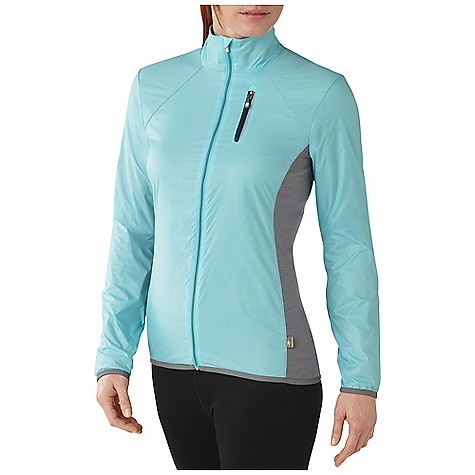 I feel the sizing is accurate, it's just that this jacket is designed with an athletic and minimalist fit. Out of necessity (freezing cold conditions), I had to pair it with a fleece and/or down puffy a few times…this is when I would have been better served by a size medium. If given the choice again, I would still go with a size small, since normally I only wear it with one layer. The sleeves are also a bit short on me (as can be seen in the picture below), riding about an inch or two above my wrists when I extend my arms out straight in front. The hood is very snug, as well. There is barely room for a beanie, let alone any type of helmet—forget it. Sorry I don't have a picture of me with the hood up but it does fit over my Black Rock down beanie and my Buff...I just never thought to take pictures with it up since it covered my face too much (not that the Buff didn't, as well). All in all, I was happy with the fit. I wore this jacket nearly every day in the cool mornings and evenings on the PCT, both while I was hiking and just hanging out in camp. I never noticed any discomfort or restriction. It is only from some pictures that I observed that the jacket looks a bit tight on me. A friend remarked that if she didn’t know better, she would have thought that I got a bit chubby while on the trail. 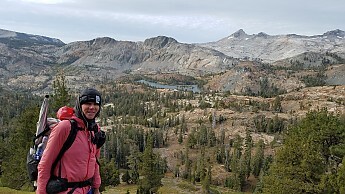 On this particular day, I had on ALL my layers (Trew Merino Pocket T, fleece, and down puffy), it was so cold and windy in the Desolation Wilderness, CA. So I look a bit bloated...I assure you, I had actually lost a lot of weight. There are no cords or drawstrings anywhere on this jacket, lending to its minimalist design. The wrist cuffs and back of the hood have a small panel of elastic and the waist and neck hems are stretchy, that’s about it. There is no way to adjust the hood, but it fits so snugly that it stays put. A drawstring on the waist hem would be a nice addition, but I didn't find I needed one. Being outside for months at a stretch, I thought I would have ample opportunity to test the jacket’s water resistance. But it really only rained once in the 2+ months that I carried the jacket on my thru-hike. My very first day on the trail, a late afternoon thunderstorm brought heavy rain. It was so heavy that I quickly deployed my trekking umbrella and used the jacket mostly as a thermal layer. I planned to try using the jacket in light rain, without my umbrella, but I never got another chance. The only other exposure was to condensation and mist. 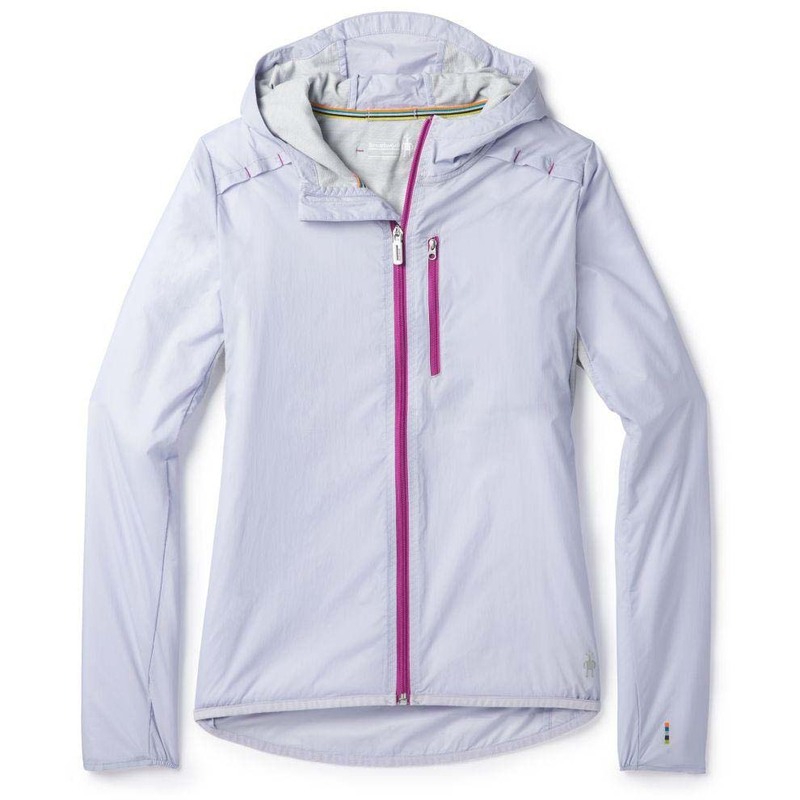 The jacket does provide good protection from these light forms of precipitation but would not protect in a downpour. 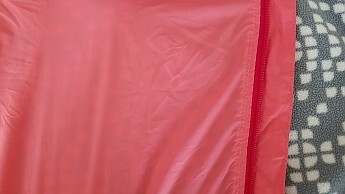 Despite the DWR material, the merino mesh panels would allow rain to eventually soak through the back. I did note that the DWR coating caused water to bead nicely on the surface. Also, the materiel dries very quickly. I could wash the jacket and put it on to wear without even drying it, as it soaks up so little water. I think this is an ideal ultralight weather shell when paired with a trekking umbrella. 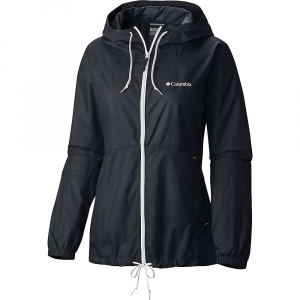 In summer conditions, a rain jacket can be replaced by an umbrella altogether. 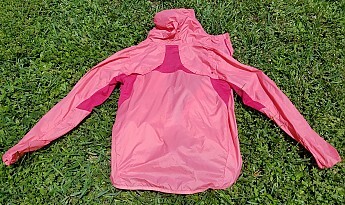 But it’s still nice to have some sort of water-resistant wind-stopper for situations where it may not be possible to use an umbrella (too windy or overgrown trail) or just as an additional thermal layer. 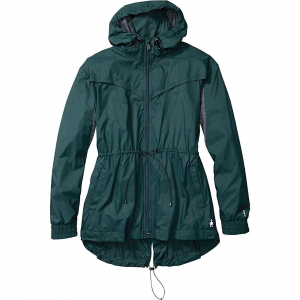 The weight and comfort of this jacket make it a good candidate to replace a heavier rain jacket. I started the trail with both my rain jacket and this shell, just to be on the safe side. But I shortly ditched my rain jacket and used this jacket on its own through most of Washington, all of Oregon, and Norther California (about 1400 miles), until I reached the Sierra. Conventional wisdom would have said its folly to go without a rain jacket in the Pacific Northwest, but I lucked out with the weather (plus had the backup of an umbrella, which in hindsight, I could have done without, too). 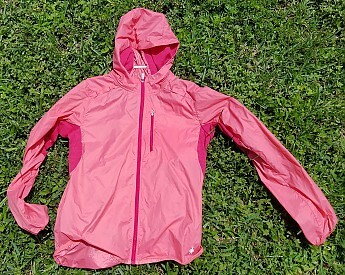 So ultimately, this shell was the perfect ultralight jacket for a summer thru-hike on the PCT. This is the jacket’s best attribute. 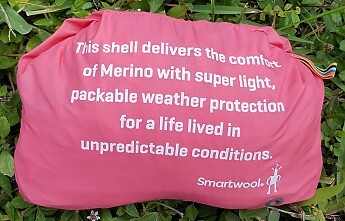 Merino wool is combined with stretchy polyester in a series of mesh panels under the arms, between the shoulder blades, and front sides of the hood and neck. The material is so mesh-like that you can actually see the little vent holes when held up to the light. There are also vent flaps along the front shoulders. This unique design creates an effective heat and moisture dumping tapestry while limiting exposure to the elements and keeping the weight minimal. The mix of lightweight nylon and merino mesh also makes for a soft and pleasant feel against the skin. This jacket can easily be worn with just a t-shirt or tank-top underneath, while not feeling clammy, sticky or crinkly where it comes in direct contact with skin. 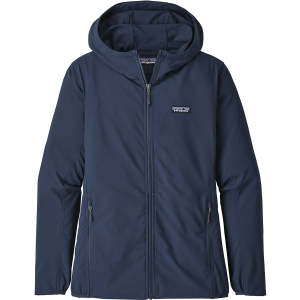 I found this to be one of the most comfortable jackets to hike in, even while going uphill or when the temps creeped up. Many days, I left it on far longer than I would any other shell, either because it provided good sun protection or for another critical reason…bug protection…more about this later. Not surprisingly, the paper-thin nylon and mesh materials don’t provide much thermal protection at all. Then again, they aren’t designed to. But when paired with a few thermal layers underneath (a merino baselayer, light fleece and/or minimalist down puffy), the jacket did protect me from some pretty harsh, bitterly cold (sub-zero) winds. 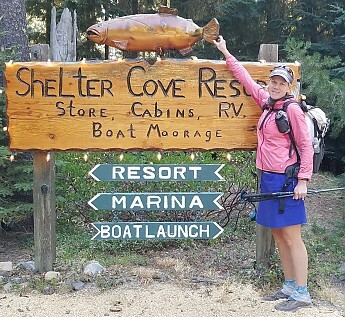 Sure, there were a few times that I wished I had a beefier shell (which is why I switched to my Marmot rain jacket for the Sierra). But on the whole, this jacket was just right for July and August. In two plus months of constant use, the jacket did not suffer any tears or abrasion, which is significant given that the material is so thin and seemingly fragile. I wore it with my pack on, going through overgrown trail, a few bushwacks, setting up and breaking camp every night/morning, and even to sleep in a couple nights. The jacket got dirty, but was easy to launder and still looks like new. The only sign of wear is some minor piling on the merino mesh panels. Also, all the iron-on logos peeled off (which is an improvement, IMO). All seams, zippers, and hems are in good shape, with no apparent defects and no deterioration from use. 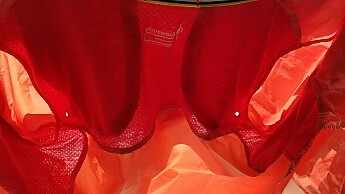 One downside of the lightweight material is that it is semi-transparent. Why would this matter? Normally it wouldn’t, but as a thru-hiker, I carry no spare clothing. When laundry day comes around every so often, thru-hikers usually rely on wearing their rain gear (or down puffy) while the rest of their possessions go through the wash. Since it was usually way too hot for my puffy, I had to take some creative measures to cover up certain parts when using the jacket on its own. You can just see the spotted pattern of this fleece showing through underneath the thin nylon. Another dislike was the color of my sample. 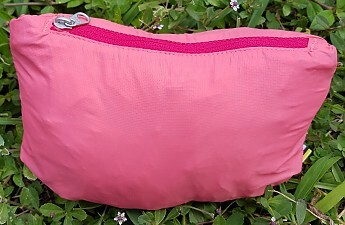 Officially it’s titled “coral” but to me, pink is pink and if given the option, is a color that should never make an appearance on a thru-hike. 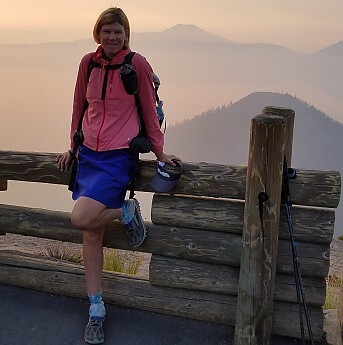 But gear testers can’t be choosers, so I embraced the look and became one of the most brightly colored thru-hikers on the trail (imagine this jacket paired with my blue skirt, green Fjallraven tights, black mitts, and black hood…yes, a mismatched nightmare). In fact, most people didn’t initially peg me as a thru-hiker because I looked too clean and/or brightly colored. 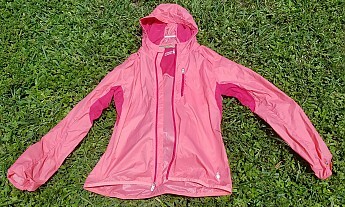 Fear not pink-haters, this jacket also comes in black, grey, and white. Aside from the functionality already mentioned, I was pleased to find that this jacket doubled as a decent bug shirt when the mosquito levels became INSANE in southern Washington. I never expected them to be so bad, otherwise I might have brought along some form of lightweight bug suit. I kid you not, the mossies were chasing me down and biting me on my back, even as I RAN down the trail in the middle of the day. When I found the clouds to be too insufferable, I would don this jacket and find relief. Try as they might, they couldn’t get through the nylon material. I hiked with the jacket on all day some days, in the peak of the summer heat. I couldn’t have worn it in such conditions if not for its exceptional breathability. For this additional reason, it became invaluable to me during this stretch of my thru-hike. There are a couple additional features not previously mentioned. The zipper has a small housing, "garage" at the neck. 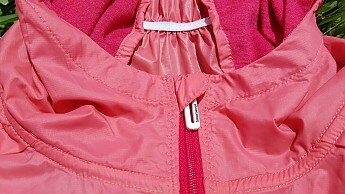 There is also a small front pocket, which becomes the jacket's stuff sack. This makes it very easy to stuff into a bag or clip onto a pack or harness. 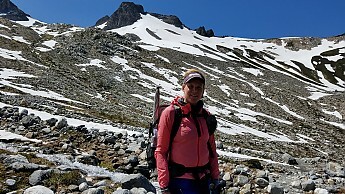 Thanks to Smartwool and Trailspace Review Corps for the opportunity to field test this jacket! 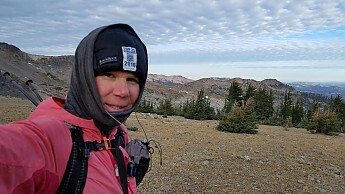 I used the jacket for part of my thru-hike of the Pacific Crest Trail, from July 6th to September 13th, 2018, in temperatures ranging from 30-80 degrees F.
Excellent review, Twig! And congratulations again on your PCT thru-hike. Thanks for testing this jacket during your hike.